Using the powerful trick of gravitational lensing, a European and American team of astronomers have constructed an extensive "mass map" of one of the most massive structures in our Universe. They believe that it will lead to a better understanding of how such systems assembled and the key role of dark matter. 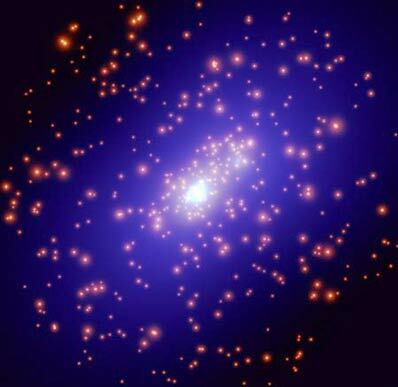 Clusters of galaxies are the largest stable systems in the Universe. They are like laboratories for studying the relationship between the distributions of dark and visible matter. In 1937, Fritz Zwicky realised that the visible component of a cluster (the thousands of millions of stars in each of the thousands of galaxies) represents only a tiny fraction of the total mass. About 80-85% of the matter is invisible, the so-called 'dark matter'. Although astronomers have known about the presence of dark matter for many decades, finding a technique to view its distribution is a much more recent development. Led by Drs Jean-Paul Kneib (from the Observatoire Midi-Pyrenees, France/Caltech, United States), Richard Ellis and Tommaso Treu (both Caltech, United States), the team used the NASA/ESA Hubble Space Telescope to reconstruct a unique "mass map" of the galaxy cluster CL0024+1654. It enabled them to see for the first time on such large scales how mysterious dark matter is distributed with respect to galaxies. This comparison gives new clues on how such large clusters assemble and which role dark matter plays in cosmic evolution. Tracing dark matter is not an easy task because it does not shine. To make a map, astronomers must focus on much fainter, more distant galaxies behind the cluster. The shapes of these distant systems are distorted by the gravity of the foreground cluster. This distortion provides a measure of the cluster mass, a phenomenon known as "weak gravitational lensing." The investigation has resulted in the most comprehensive study of the distribution of dark matter in a galaxy cluster so far and extends more than 20 million light-years from its centre, much further than previous investigations. Many groups of researchers have tried to perform these types of measurements with ground-based telescopes. However, the technique relies heavily on finding the exact shapes of distant galaxies behind the cluster. The sharp vision of a space telescope such as NASA-ESA's Hubble is superior. The study reveals that the density of dark matter on large scales drops sharply with distance from the cluster centre. This confirms a picture that has emerged from recent detailed computer simulations. As Richard Ellis says: "Although theorists have predicted the form of dark matter in galaxy clusters from numerical simulations based on the effects of gravity alone, this is the first time we have convincing observations to back them up. Some astronomers had speculated clusters might contain large reservoirs of dark matter in their outermost regions. Assuming our cluster is representative, this is not the case." The team noticed that dark matter appears to clump together in their map. For example, they found concentrations of dark matter associated with galaxies known to be slowly falling into the system. Generally, the researchers found that the dark matter traces the cluster galaxies remarkably well and over an unprecedented range of physical scales. "When a cluster is being assembled, the dark matter will be smeared out between the galaxies where it acts like a glue," says Jean-Paul Kneib. "The overall association of dark matter and "glowing matter" is very convincing evidence that structures like CL0024+1654 grow by merging of smaller groups of galaxies that were already bound by their own dark matter components." Future investigations using Hubble's new camera, the Advanced Camera for Surveys (ACS), will extend this work when Hubble is trained on a second galaxy cluster later this year. ACS is 10 times more efficient than the Wide Field and Planetary Camera 2 used for this investigation, making it possible to study finer mass clumps in galaxy clusters and help work out how the clusters are assembled.